Used by kind permission of Ken Rockburn and available for Kindle and also in hard/soft cover. Please support the author by purchasing this amazing book: "[Le Hibou] was the locus of hip, the venue for cool, the scene of the scene. Through its doors passed the likes of Neil Young, Leonard Cohen, Joni Mitchell, George Harrison, Gordon Lightfoot, Van Morrison, Muddy Waters, Howlin’ Wolf, Otis Spann, Saul Rubinek, Rich Little, Irving Layton, William Hawkins, John Hammond, David Wiﬀen, Ramblin’ Jack Elliot, Bruce Cockburn, TBone Walker, Sonny Terry, Brownie McGhee, Phil Ochs, Odetta, Tom Rush, Jesse Colin Young, Lenny Breau, Kris Kristoﬀerson, Richie Havens, and hundreds more. By the mid-1960s, the unrelenting, cranked-up electric sounds of rock were beginning to drown out the acoustic folk music that had dominated the North American coffeehouse scene for almost a decade. Bob Dylan had gone electric at Newport in ’65, dragging a large chunk of the folk scene kicking and screaming into the rock world. The year 1967 had witnessed the Summer of Love, and the resulting psychedelia of the Haight in San Francisco was washing across the continent. But the folkies still had a couple of surprises up their sleeves. Roberta Joan Anderson had come out of Saskatoon, Saskatchewan, with only a guitar and a head full of lyrics and she was doing journeywoman work on the coffeehouse circuit as Joni Mitchell, the surname of the husband she had divorced the previous year. In 1967, Mitchell was plugging away at an exhausting tour across Canada and the United States, playing small venues and coffeehouses that demanded two sets of music a night and three sets on weekends. By June, she had reached Ottawa for an extended engagement at Café Le Hibou. The gig also included a live concert at Camp Fortune in the Gatineau Hills, a concert recorded by the CBC as part of its Summer Festival Series. Denis Faulkner booked her for next to nothing. “She wasn’t very well known, so I got her for $150 a week versus 50 percent of the door, and I hired her for three weeks,” he recalled. Prior to meeting Crosby [ed note: actually, she met Crosby first], Mitchell had met Elliot Roberts in New York and he had taken her on as his first managerial client. Roberts and Crosby then shepherded her through the recording of her first album in Los Angeles. Song to a Seagull (originally called Joni Mitchell) would be released on Frank Sinatra’s Reprise label, part of Warner Bros. Both Mitchell and Crosby were very conscious of having to protect her singing style and appearance, working hard to make sure her first record presented her as she actually was. According to Mitchell, the record company wanted to “folk rock” her up, but Crosby and Roberts wanted to present her as the cutting edge of a “New Movement.” To pull that off, Crosby, with his Byrds cachet well in hand, told the record company he would produce the album himself. Then he pretty much just kept out of it. That move alone gave Mitchell the control she wanted and maintained for the rest of her career. She has said Crosby did a “solid favour” for her that she never forgot. So eight months after her original gig in Ottawa, with Song to a Seagull recorded but not yet released, a new manager, and a relationship with a rock star, Mitchell returned for a two-week engagement. This time she was staying at the upscale Chateau Laurier Hotel. The Chateau, with its castle-like turrets, grand ballrooms, and views of the Parliament Buildings, was the hotel of choice for visiting rock stars. It was also just two blocks away from Hibou’s Sussex Drive location. Only three days after that auspicious opening, Joni Mitchell would meet someone who would change the course of her life for the next several years. After her set at Hibou that night, Joni went to a small party for the band members. Harvey Glatt, his wife, Louise, and Bruce Cockburn went with her. Graham Nash, who was beginning to have thoughts about extricating himself from the Hollies, had been given a heads-up about the young singer from David Crosby but he had forgotten all about it until he saw Joni sitting by herself. “We could see that a thing was happening between Joni and Graham so we left,” recalled Glatt. He was not mistaken. Nash recalled the night vividly. “I see this woman across the way sitting on a chair with what looked like to me a large bible on her knee, which was intriguing. More intriguing was the fact that she was one of the most beautiful creatures I had seen in a long, long time,” he said. He somehow managed to make it to Winnipeg to continue the Hollies’ tour and Mitchell carried on with her Hibou gig. But by summer they would be living together in Mitchell’s new house in Laurel Canyon, California, ultimately skirting very close, said Nash, to marriage. The second significant event for Mitchell that March happened just four days later, on Tuesday the 19th. Harvey Glatt’s Treble Clef Entertainment brought in Jimi Hendrix to play the Capitol Theatre. Tickets sold so quickly that a second show was added at six in the evening, with the originally scheduled show at eight-thirty. Ticket prices ranged from $2.50 to $4.50. The Capitol was one of those old, ornate, neo-Baroque theatres with gingerbread embellishments and wide staircases to the loges and balconies. The rag-tag, hippie audience seemed somewhat out of place pouring into that staid cavern late that sunny, warm afternoon. Inside the Capitol, Doug McKeen was preparing to record the concert for Treble Clef. McKeen was a young, ambitious entrepreneur who cobbled together an income by playing records at weddings and birthday parties and doing the sound for the increasing number of concerts that Treble Clef was producing. But that day, his business partner was sick, and he was on his own. This meant that he was simultaneously working for himself and for Harvey Glatt. Arthur II wasn’t the only lucky guy that day. Aspiring guitarist Don Wallace also lucked out. Like Arthur, Wallace wasn’t an especially big Hendrix fan—he leaned more toward Eric Clapton and Cream. But he wasn’t about to refuse the good fortune that came his way that day. “I bought a ticket, and it was for the second show, and my ticket was way up in the rafters,” he recalls. “I was standing out in front of the Capitol Theatre—I’m sure kids still do it today, looking groovy before the concert—and a guy I knew had just had a fight with his girlfriend. She went running down the street with him in hot pursuit, and he handed me his ticket. It was in the front row on the left-hand side of the theatre, so I was sitting right in front of Jimi Hendrix in the front row. On October 21, 2001, Experience Hendrix, the corporation that controls Jimi’s estate, released The Jimi Hendrix Experience Live in Ottawa. There is some confusion as to whether that recording is from the missing McKeen tapes or from the tape that Hendrix himself made. Doug McKeen has been told that there was a second mike taped to his stand, but he can’t remember seeing one. He has also read reviews of the bootleg album commenting on the “stereo imaging.” But his recorder was mono, and Hendrix would have needed two mikes, which he clearly did not have. The mystery will likely never be solved. Arrived in Ottawa… beautiful hotel… strange people. Beautiful dinner… talked with Joni Mitchell on the phone. I think I’ll record her tonight with my excellent tape recorder (knock on wood)… hmmm… can’t find any wood… everything’s plastic. Beautiful view. Marvelous sound on first show. Good on 2nd. Good recording. Went down to the little club to see Joni— fantastic girl with heaven words. So after two blistering shows that would have exhausted any normal person, Jimi Hendrix decided to go to Le Hibou and tape Joni Mitchell’s performance. Bill Hawkins was at Hibou and Joni asked him if he would go pick Hendrix up. Hawkins drove over in his old Borgward (a vintage car from a German company that went out of business in the early sixties and ended up being bought by the Mexican government). “I picked him up at the Capitol Theatre after his gig there and brought him down to Le Hibou with this huge big reel-to-reel so he could record her.” Hawkins found Hendrix to be “a very laid-back guy,” who was impressed with the Borgward, and the trip consisted mostly of them talking about the car. Hawkins dropped Hendrix off in front of Le Hibou, where he was joined by a couple of record company reps. John Russow, the relatively new owner of the coffeehouse, was taking admission money at the door. Inside the front entrance of Hibou was a little square foyer with a pay phone on one wall, and opposite was the table where Russow sat. 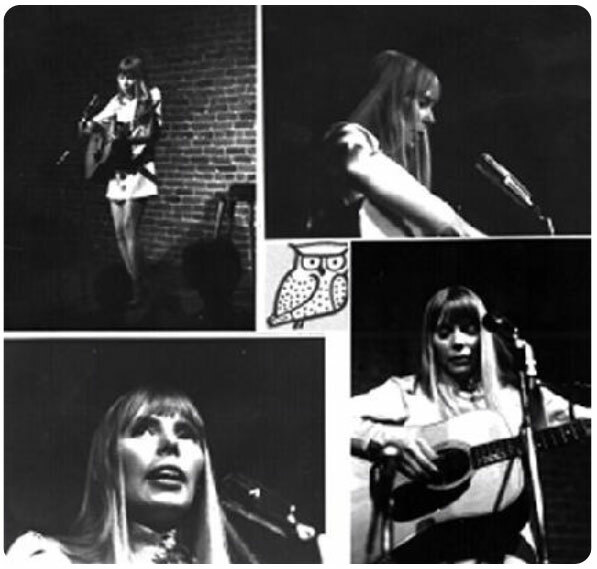 Later that month, Song to a Seagull was released and Joni Mitchell, twenty-four years old, began her climb to musical legend status. Two-and-a-half years later, on September 18, 1970, Jimi Hendrix died of a reported accidental overdose of sleeping pills combined with wine. He was twenty-seven. This article has been viewed 30,148 times since being added on January 28, 2017.